Jerry Yoshitomi (USA) is a leading international cultural facilitator who presented a series of workshops and public lectures in Melbourne, Sydney and Canberra. Jerry examined ways of increasing public participation in the arts by audiences, patrons, communities, institutions and business. Jerry Yoshitomi has contributed internationally to arts leadership, increasing opportunities for cultural exchange, and in creating multicultural collaborations. His work examines the creation of new knowledge and inventive approaches to the increase of the public value of arts. Jerry seeks to make the transaction between consumers and arts makers a transaction for the whole of society, engaging communities and their advocates, businesses, artists and art managers and policy makers, in the process. Jerry Yoshitomi is engaged by major national and regional foundations, universities and arts presenters in North America to read, research, provoke, and speak on increasing participation in the arts. He examines creativity, knowledge management, contemporary leadership practices and the augmentation of the public value of the arts across society. 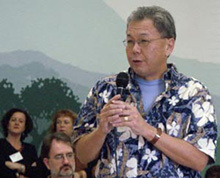 Jerry Yoshitomi chaired the National Task Force on Presenting and Touring the Performing Arts that resulted in the 1989 seminal report, An American Dialogue. He was formerly the Executive Director of the Japanese American Cultural and Community Center in Los Angeles, served on the California Arts Council, and was Vice President/Director of Operations for Western States Arts Foundation (now WESTAF). learnt new ways to communicate the public value of the arts to officials, funders and civic leaders, and the wider public. Jerry Yoshitomi's workshops were ideal for all arts and cultural managers, community partnership managers, artistic directors, festival organisers, artists, cultural planners, funding agency and philanthropic organisation representatives, arts marketers, producers and promoters, and venue managers. Presented by the Australia Council’s Community Partnerships and Market Development Division through it’s Leading Voices program, Kape Communications, Arts Victoria, City of Stonnington, Multicultural Arts Professional Development (MAPD), RMIT, the Australian Multicultural Arts Foundation, Museum of Contemporary Art, and Canberra Arts Marketing.